The LEED AP with Specialty credential is for professionals seeking to demonstrate an advanced depth of knowledge in green building practices; it also will reflect the ability to specialize in a particular LEED Rating System. For example, if you are a residential home builder, you would specialize in LEED Homes. You can attain multiple specialty designations by passing multiple exams. To become a LEED Accredited Professional (LEED AP) with Specialty, an individual must first pass the LEED Green Associate exam and then at least one LEED AP specialty exam. Prior to sitting for the LEED AP with Specialty exam, a candidate should have experience working on a LEED project. If a candidate does not have work experience, they can use their LEED Green Associate credential to gain experience if they wish to pursue an advanced LEED AP credential. The LEED AP exams are 100 questions and last two hours. You must score at least 170 out of 200 in order to pass. While the LEED Green Associate focuses on concepts and terminology, the LEED AP with Specialty exam tests a candidate's in-depth understanding of one of the five main rating system categories. You will have to memorize performance thresholds (percentages of energy savings for example) and perform calculations during the exam. At this level, we also recommend starting with a course. A LEED AP Specialty course will jumpstart and focus your study efforts. The LEED AP with Specialty exams are memorization intensive, and it is critical that you focus on the right material. Although the USGBC reserves the right to test you on any aspect of the rating system and the LEED certification process, in practice some areas are easier to test than others. We show you those areas. Once you have completed a course, you should expect to study for 30-40 hours with the provided study materials (study guide, memorization sheets, and practice exam questions) and will need to memorize the standards cold before taking the exam. After training, you will register and pay for the exam through the USGBC website, which is www.usgbc.org/credentials. Please Note: The USGBC offers a combined GA/AP exam for $400 (or $550 for non-members). 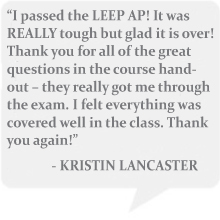 This "full exam" offers the 2-hour Green Associate exam immediately followed by the 2-hour LEED AP Specialty exam. Candidates choosing this option should be experienced in the LEED certification requirements and process, as it is required to pass BOTH portions of the exam to earn a LEED credential. When you are ready, the exam is available six days a week (Monday-Saturday, 8 a.m.-8 p.m.) at any Prometric Testing Center. It is a computerized exam. You will not have access to anything but the exam screen (i.e., no Internet). The exam is closed book, so you will have to learn all of the required knowledge (we have many memorization aides built into our courses). The benefit of taking the exam on a computer is that you will receive your score and find out if you passed before you leave the testing center. Go back to the LEED Credentialing Process information page.